Soup season is here, and we aren’t mad about it at all! 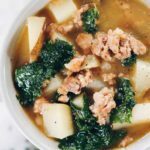 You’ve probably noticed that crockpot meals and soups are a fall and winter go-to for us! 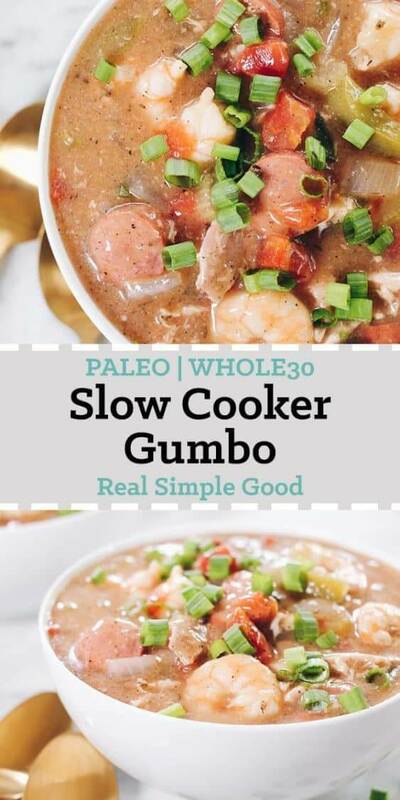 This slow cooker Paleo gumbo is the perfect addition to your meal planning. Growing up in the Pacific Northwest, I don’t feel like I really had much exposure to gumbo. It wasn’t something my mom made for us, and there aren’t a ton of restaurants that serve it. I have to admit though that I feel like I was missing out! I had no idea how flavorful and fun gumbo is! 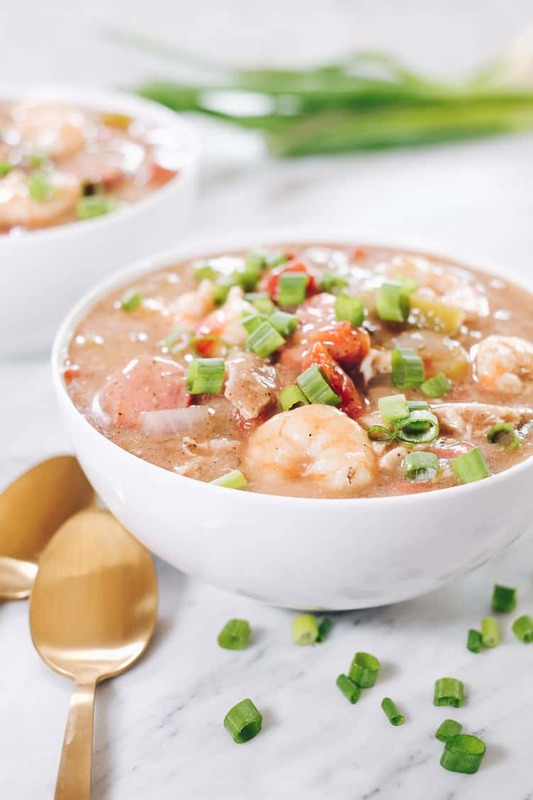 If you’re less familiar with gumbo like me, it is a soup that is filled with so many goodies. 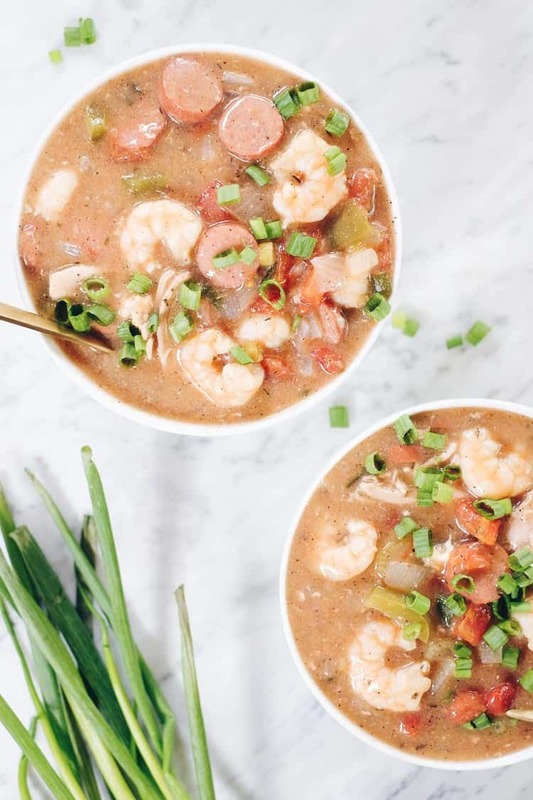 In this Paleo gumbo, we’ve packed it with chicken thighs, sausage and shrimp in addition to veggies and lots of seasonings. 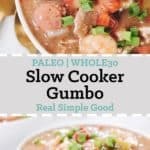 This slow cooker Paleo gumbo is pretty dang easy to make, but there is a second step beyond simply loading the crockpot! 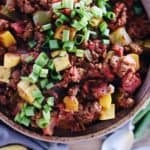 You just get the ingredients prepped and added to your crock pot or slow cooker, and then let everything cook while you go about your day. When there is about 30 minutes left or about 30 minutes before you plan to eat, add the pre-cooked sausage and shrimp to the crockpot. The shrimp will turn pink and be ready by the time you are ready to ladle the soup into big hearty bowls! If you are looking for a recipe to add a little kick and spice to your week, this is it! 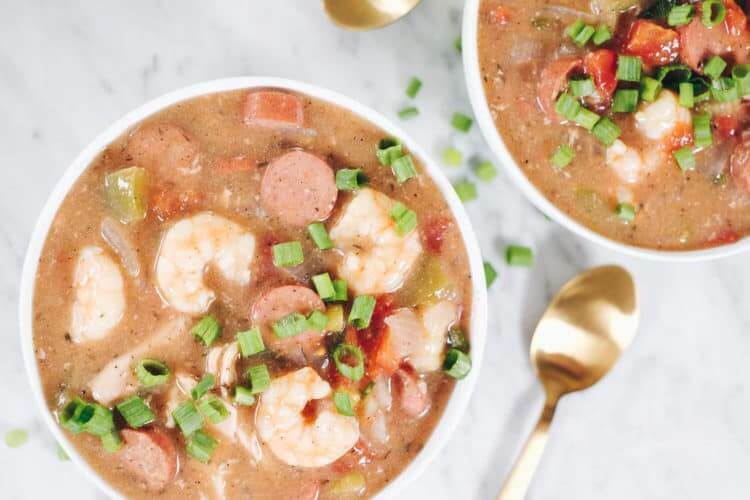 Our Paleo gumbo is so packed with flavor and spice, you’ll enjoy the party in your mouth with every bite! 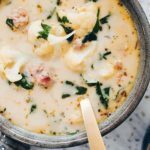 This soup is packed with protein from the chicken thighs, sausage and shrimp. It also has lots of veggies, like onion, bell pepper, celery and tomatoes. Plus, the herbs and spices! There is garlic, bay leaves, cajun seasoning and thyme. 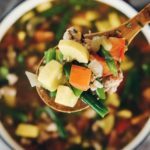 Just reading about it, you can start to get an idea of the many flavors packed into this Paleo gumbo! 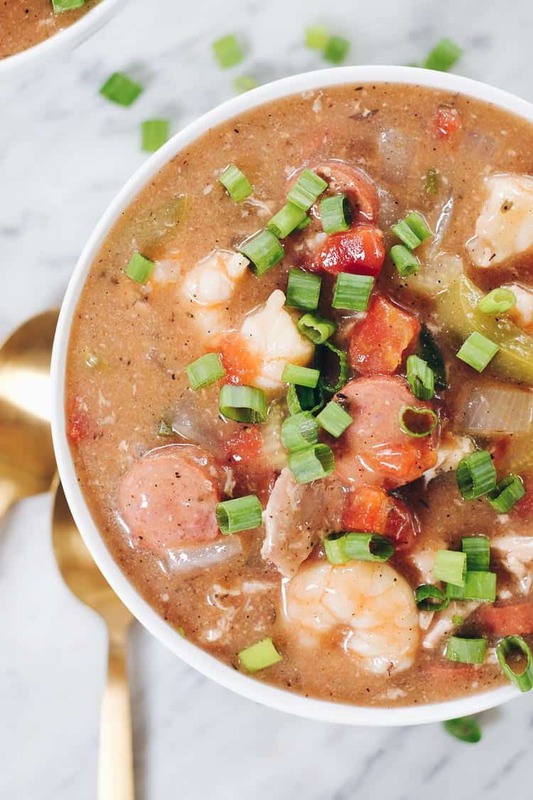 Go ahead and add this Paleo gumbo to your agenda this week! It will be a tasty and easy way to enjoy the coziness of fall! Let us know how it goes by leaving a comment below. Also, take a photo and tag us on Instagram @realsimplegood, so we can check it out! 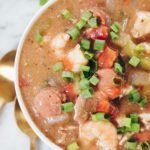 This Paleo gumbo is packed it with chicken thighs, sausage and shrimp in addition to veggies and lots of seasonings. It's also Whole30 compliant! Whisk together chicken broth and arrowroot flour until no lumps remain. Set aside. Chop onion, bell pepper, celery as noted and peel and smash garlic. 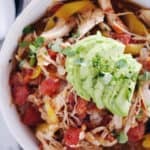 Place chicken in the bottom of the slow cooker and toss in the onion, bell pepper, celery, garlic, and bay leaves. Sprinkle cajun seasoning and thyme over everything. Pour in the diced tomatoes and chicken broth. Cook on low for 8 hours or on high for 4 hours. When the gumbo has 30 minutes left, slice up the sausages and green onions. Add the sausage, shrimp and 3/4 of the green onions to the slow cooker. Cook for the remaining 30 minutes until the shrimp is cooked through. Shred the chicken with two forks. Ladle gumbo into bowls, sprinkle with remaining green onions and serve. My husband will love this!! Love the combo of proteins you added. Do you cut up the chicken thighs before you put them in the slow cooker? Or are you shredding them at some point before you serve it? Can’t wait to try this!!!!!! Gonna serve it over some leftover cauliflower rice! Hi Lynne – We shredded the thighs right before serving. I just updated the recipe to note that. We hope you enjoy the gumbo! I just made this recipe and it is delicious. A masterpiece. Thank you very much. 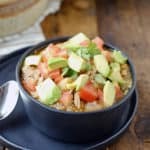 If making this recipe in the InstantPot, how long do you recommend on the soup setting? Thanks! We’ve never made this recipe in the Instant Pot so we aren’t totally sure. However, when we do shredded chicken thighs we usually do them for 25 minutes on manual with a quick release so that’s what I’d try. You’ll have to stir in the shrimp at the end after releasing the pressure and shredding the chicken. The shrimp should cook fairly quickly 3-5 minutes in the hot broth. Let us know how it goes! Hello! Thanks for the help, your advice worked like a charm. I didn’t end up adding the shrimp (shellfish allergy), but added a few extra chicken thighs instead. Still shredded perfectly after 25 mins on high pressure with quick release. Thanks again!